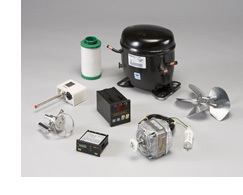 As one of the largest distributors of refrigerated compressed air dryers in Canada, CAG Purification is committed to serving our clients by stocking replacement parts for everything that we sell. Given the importance of compressed air systems uptime, CAG ensures stock for all major components and wearing parts which are readily available to customers from our Oakville, Ontario warehouse. CAG only stocks OEM original parts at competitive pricing with next day deliveries across Canada.